Just simply beautiful. A piece to truly love. 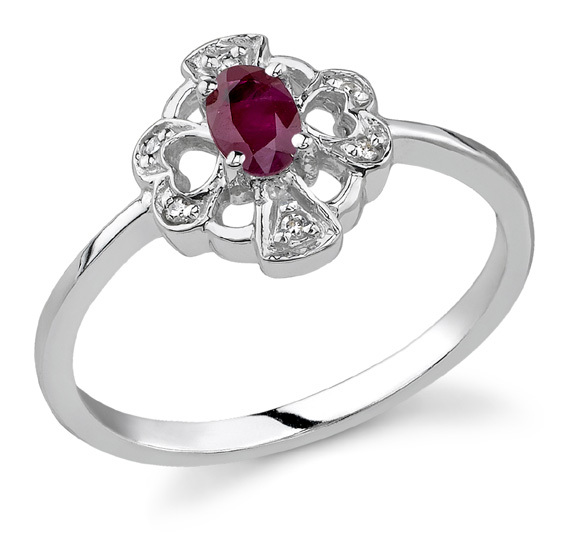 Our 14k white gold ruby ring is shaped in the design of a cross with hearts delicately cut-out on the sides. The genuine, natural ruby in the center represents God, the Son. 6 diamonds weigh a total of 0.03 carats, in H-I Color, I1 Clarity. Ruby weighs 0.25 Carats, measuring 5mm x 3mm in size. Also available with a sapphire gemstone or tanzanite gemstone, shown below. We guarantee our Cross and Heart Ruby and Diamond Ring, 14K White Gold to be high quality, authentic jewelry, as described above.